Ang Dating Daan, widely translated in English and being broadcast in different parts of the globe as The Old Path, held its 38th anniversary celebration from December 10-14, 2018. 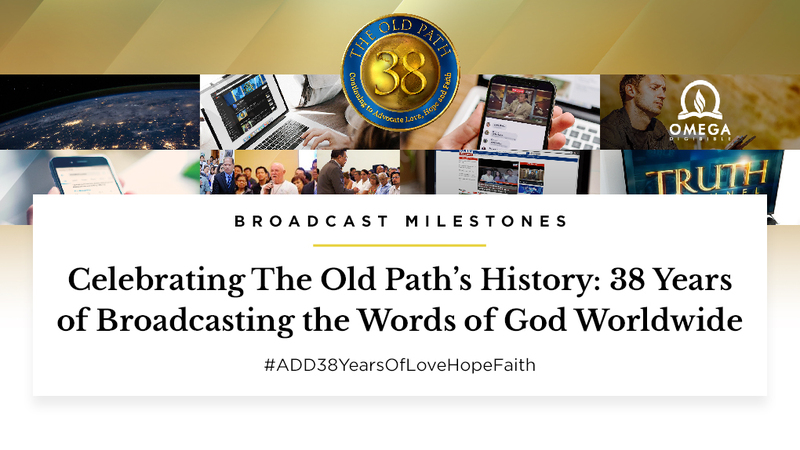 As part of the commemoration, here’s a rundown of some of The Old Path’s milestones and achievements after 38 years in bringing God’s words unto all nations, specifically in the digital space. The Old Path entered the World Wide Web after it launched its official streaming website in year 2000. With the fast and continuous advent of technology, The Old Path hosts Bro. Eli Soriano and Bro. Daniel Razon make good use of various digital platforms to propagate the gospel of Christ across all nations, especially to those who are active internet users. When AngDatingDaan.org debuted, it initially featured question-and-answer videos and live streaming of Bro. Eli’s programs. Online video streaming platforms, primarily Youtube houses Bro. Eli’s Q&A videos, which were derived from his Bible Expositions. The official websites of The Old Path, Ang Dating Daan, the Members Church of God International (MCGI), and of Bro. Eli also feature his question-and-answer videos. The radio-television host’s program videos are being shared by netizens online for being both educational and informative. Facebook Live and Youtube’s live streaming features are being utilized by MCGI to reach a wider span of audience. The Worldwide Bible Expositions, which the MCGI hold regularly, features a biblical symposium format through the segment “Itanong Mo Kay Soriano, Biblia Ang Sasagot” (Ask Bro Eli, The Bible Will Answer). MCGI unveiled its very own Bible application called the Omega DigiBible n April 2018. The app is free to download in both Google Play and the App Store. Furthermore, users can bookmark, place comments, highlight and copy Bible verses, and take notes in the app. It also features “Top of the Hour Prayer”, which enables users for a one-minute prayer available in English, Tagalog, Spanish and Portuguese. The “A Preacher’s Blog” feature contains the blog posts by Bro. Eli, posted in the controversyextraordinary.com. Every Worldwide Bible Exposition, netizens participate in the online conversations on Twitter hosted by the The Old Path online channels. With the help of God, official hashtags of the Church’s Bible Exposition events trend on Twitter almost every time there are online conversations. When Bro. Eli left the Philippines in 2005 in an intensified global propagation efforts of MCGI, this was followed by the translation of The Old Path content into various languages including Spanish, Portuguese, Italian, German, and Chinese, among others. In South America, Bro. Eli and co-host Bro. Daniel are hosting The Old Path (translated as El Camino Antiguo in Spanish, and O Caminho Antigo in Portuguese) to cater to locals in Central and South American nations. The Latin American counterpart of The Old Path’s website, http://elcaminoantiguo.com/, and its South American counterpart, http://ocaminhoantigo.tv/, also feature Bible Expositions and Q&A videos of Bro. Eli. The programs, El Camino Antiguo and O Caminho Antigo’s Facebook pages and Youtube channels provide live streams of Bible Expositions. Meanwhile, The Old Path can also be streamed through UNTV News and Rescue. To date, there are translations of the show in languages and local Philippine dialects such as Chinese, Bicolano, and Waray, among others. The broadcast of the program The Old Path broadcast is also being simulcast through UNTV News and Rescue and Radyo La Verdad’s websites, respectively. The mobile apps, including Ang Dating Daan TV and MCGI App, likewise stream the program. The Truth Channel in digital format carries MCGI-produced shows. When it was launched in 2017, Ang Dating Daan programs are being streamed through the digital television’s Youtube Channel.